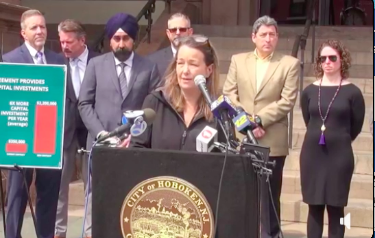 Saddled for decades with a water contract originating back to the corrupt dark days of the Anthony Russo administration, the new water contract announced Friday is a big win for Hoboken. The details are not fully clear and the contract itself isn't available but the ties to the historically bad contract where water revenues were surrendered in return to plug a budget deficit led to huge losses, seen and unseen. and Emily Jabbour last Friday. In one visible aspect, Hoboken was limited to 300K annually in infrastructure repairs to its antiquated water system with segments fully a century or more old. As the pipes began to burst, the 300K annually was quickly surpassed and residents inflicted with a growing million dollar and unpaid bill. When former mayor Dawn Zimmer proposed late in her second term a new deal, all of the bad was buried along with a suggested outstanding $8.5 million bill. The sovereignty question and competitive analysis were sorely missing in her proposed contract. The council balked and no council member sponsored it for a vote. The infrastructure portion of the bill continued climbing into the double-digit millions as the City Council sought a competitive bidding process to reclaim sovereignty for the City, much-needed dignity and any semblance of fair pricing. Finally, Mayor Ravi Bhalla after some initial saber rattling about suing for past sins signed on to the dotted line in decades past worked with the City Council to hammer out a new deal with Suez more favorable for the City of Hoboken. The thoughtful and timely focus appears to have finally turned around an abysmal situation. More details and analysis is required but there's plenty of reason to be positive with the daylight in over $30 million in committed infrastructure without the significant increases proposed in the Zimmer proposal, as reported on the Hudson County View.